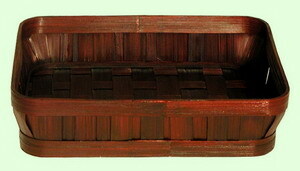 This basket is made of bamboo slats. It measures 12" long, 9" wide, 2.5" high. It is available in all finishes. The sample shown is finished in Cherry. You can find five more sizes of this basket by clicking item 21001, item 21003, item 21004, item 21005, or item 21006 to view.